I finally crossed something off of my list that had been there for far too long! Darren and I made our way to Racetrack Playa for a sunset that we will never forget. Getting here was not easy by any means, we faced bumpy, washboard roads for a good hour and a half! My brain was bouncing all over the place. Although the drive was a little treacherous, it was all worth it because Racetrack Playa was even more beautiful than I had seen in photos. We were all alone out there - and I just loved that feeling of having the whole playa to ourselves. 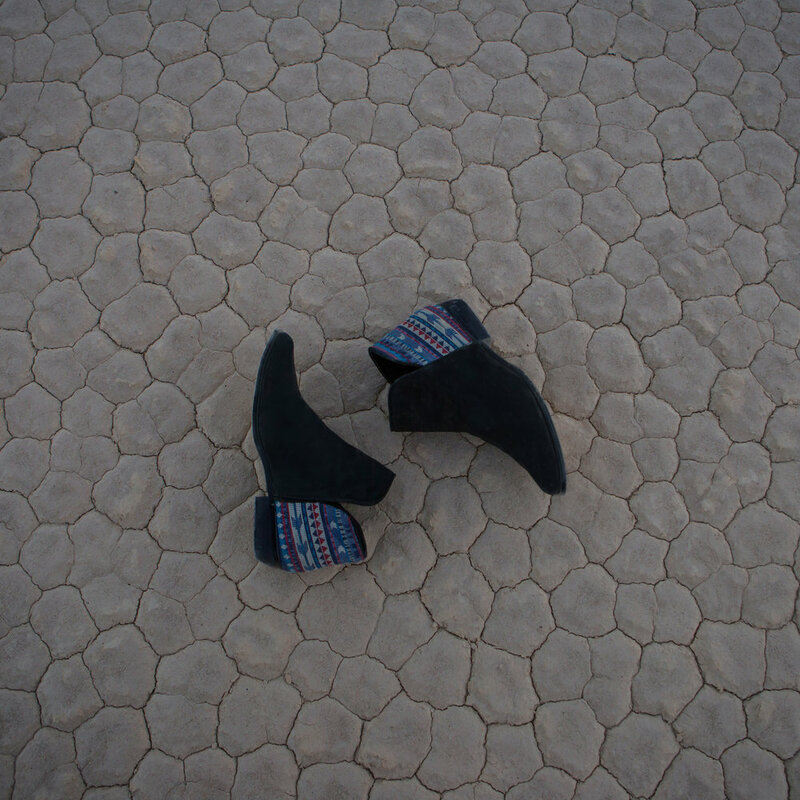 One thing I loved most about the playa was the scale-like textures on the ground. I couldn't help but think how such a texture would look on the floors of my future dream home! It was definitely one of my favorite surfaces to move and dance on. If you're wondering where those amazing booties came from, they are by Sbicca Footwear! This is the second pair that I chose from their stunning collection, and I am so happy to have them as a part of my wardrobe this fall/winter. I have already worn them so many different ways - from a fancy velvet maxi like the one I'm wearing in this shoot, to some rolled up skinny jeans and an oversized sweater. I've really been inspired by traveling lately and seeing new places. I'm eager to move again and dance. I grew up spending so much time training as a dancer - so being able to use that talent in a new light is one of the best things that happened to me. I feel some sort of release when I am out there, in a natural wonderland, moving to a favorite tune. It's these kind of moments that keep me creating. We ended up staying to see the supermoon and as the moon rose, the playa's surface began to glow! At that moment, I had to pinch myself to make sure I wasn't dreaming. It was just TOO COOL! Like out of this world cool! Take a look at what I wore in this shoot with the links below, and don't forget to check out my song of the day. It's a good one!